As in part one of this two-article series, you’re utilizing some concepts that you may already know; Scales, Arpeggios, and Embellishments. If you don’t know about some, or all or these, or just need a refresher, or some new ideas, this lesson is perfect for you. When creating a musical line, whether composed in written form or composed in an improvised context, the same mechanics come into play. In order for your ideas to sound strong and cohesive, you must start paying closer attention to where you place “key” notes within the phrase. 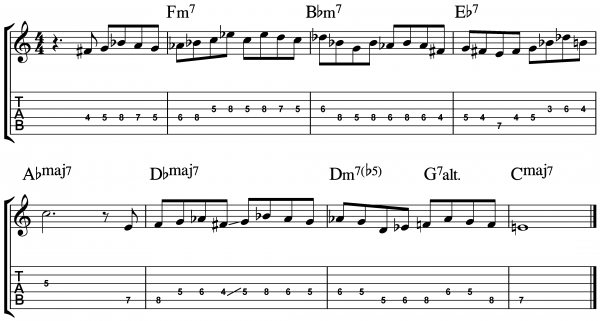 In Part 2 of this short series, we’ll discuss Embellished Melodic Arpeggios. What do I mean by Embellished Melodic Arpeggios? Arpeggios are chord-tones, the notes that spell out a chord. By playing these specific notes separately as apposed together as a chord, you are essentially playing a chord in a linear fashion. In Part 1 of this lesson we looked at Serial Melodic Arpeggios as quarter notes. For this lesson you will be playing your Melodic Arpeggios mostly as half notes. In example 1, you’ll see arpeggios written out for each chord change. Above is the typical way most people think of arpeggios. This a great example of what is NOT what I refer to as a Melodic Arpeggio. In example 2, you’ll see a simplified version of the first 7 measures of the actual melody to illustrate this point. Often these notes are referred to as guide tones. What is the melody comprised of? The answer: mostly chord-tones. The chord-tones in this case are creating a Melodic Arpeggio. Most the classic melodies in songs, ones that are most memorable, use chord-tones as a resource for comprising most of the melody. Therefore, it helps the melody sound strong. Isn’t that what this lesson about? Creating strong lines? Improvising IS essentially creating an improvised melody. Think of these chord-tones as important anchors, or posts. Kind of like a fence. When building a fence, you have to install the posts first, and then you hang the fence material to those posts. I know this because my Dad used to build fences for a living. Whoever thought that me working summers for him as a kid, and more full time a little later on, that building fences would influence how I envision creating jazz lines for guitar. These Melodic Arpeggios in example 2 have more breathing room than those used in Part one to insert your own ideas between these fence posts. So, let’s build a cool sounding line around the melody, our ready-made Melodic Arpeggio. Our fence posts. Remember? Not only does this make a great example of the backbone of this lesson, but also makes great fodder for incorporating melody notes into our solos. This is something that all the Jazz Masters have done and taught up-and-coming players to do in the past. In example 3, you’ll see how the original Melodic Arpeggio has been embellished (our fence material) to create our end product, a great sounding jazz line. In closing, let’s get back to my fence analogy. My dad built chain link fences mostly. I know all about constructing fences. Just like our finished product (our line) in example three, one sees the entire fence as a whole. Most people don’t see the separation between the fence posts (the chord-tones), and the chain link mesh (the embellishments); they just see the finished product, the whole fence (the whole line). So start constructing your line by aiming for chord-tones. Then in between those chord-tones you have you can just about play whatever you want. Now you have constructed a very robust line. I hope when you start to hear and see other master’s lines, you begin to recognize the different parts as well the whole, then utilizing the concepts above in your lines too. Each example here is done in the extreme just for illustration purposes. Doing things like this as an exercise is great to get new techniques into your playing, but don’t forget to chop your lines into phrases so your music breathes. When you combine the ideas for lines from part one of the lesson with part two, you’re now on your way to mastering the Science of Strong Lines.